Being a part of this course and working with Louise every week has done absolute wonders for my confidence. I now walk into auditions with out the daunting feeling of what will I look and sound like on camera, and I can just work on my role. It is also based in The Midlands which means I save a lot of money and time getting down to London to attend camera workshops. I would recommend Acting For Screen to any actors wanting to up their game and become audition ready. 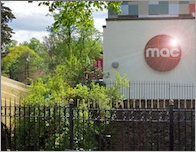 Acting for screen classes will take place at the Midland Arts Centre (MAC).